As we careen towards the finish line in this tumultuous electoral season, President Obama is asking voters to renew his contract as a father figure. And with his new, 11th-hour message that this election is all about “trust,” I think the father-thing is going to resonate. Patronizing? Perhaps. But isn’t that what parents do? They tell us what’s good for us in an “eat your spinach” sort of way and get exasperated, at times, when we just don’t “get it.” And the most annoying part of that schtick, as we all know, is that they’re often right. 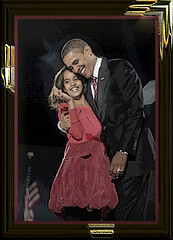 None of which is to take anything away from Romney, who also appears to be a devoted family man. But somehow, Romney doesn’t come across as our collective Dad. That may be because since he hasn’t (yet, anyway) inhabited the Oval Office, his personal life has been under less scrutiny. His kids are also a good deal older. To my mind, the image Romney projects – archetype-wise – is more that of the kind and generous businessman Uncle who shows up at Thanksgiving and slips you a 50 when your mom isn’t looking so that you can go buy something at the store that you *really* want. He’s a good person, I think. But I don’t get the same “Dad” vibe – that ineffable mix of stern authority combined with seasoned wisdom – when I listen to him speak. And perhaps, on some deeper level, that’s why when he speaks, I don’t find him as persuasive as the president. There is, of course, a great irony here, in that as we know from the president’s own autobiography, “Dreams From My Father,” his own life has in many ways been to forge an identity for himself in the absence of a father. So call me Jungian. Tell me I’ve got an Electra complex. Or just call me crazy. But I think I’m onto something. Delia Lloyd is an American journalist based in London who was previously the London correspondent for Politics Daily. She blogs about adulthood at www.realdelia.com and you can follow her on Twitter @realdelia.